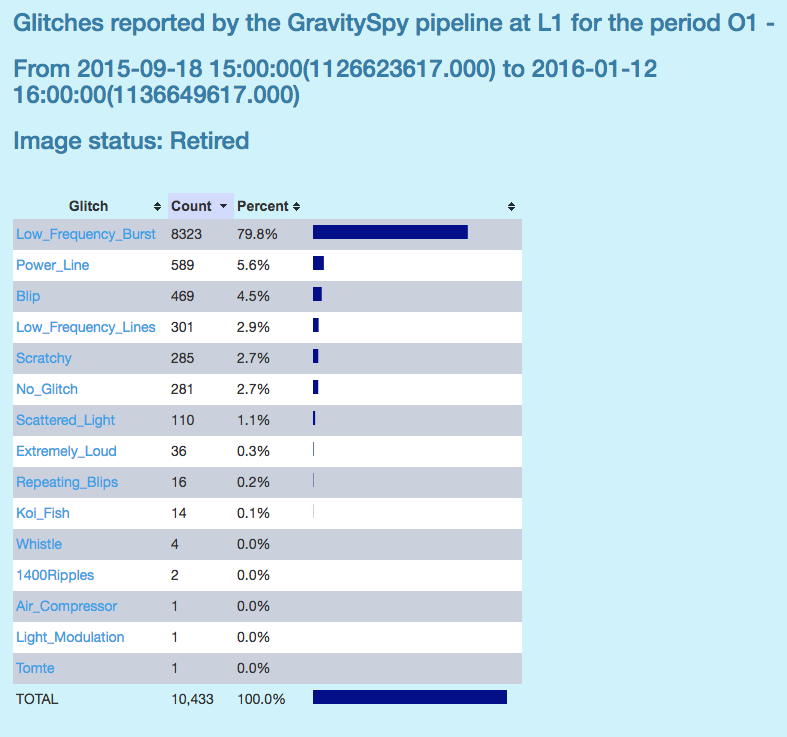 Which glitches are most common at LIGO Hanford and Livingston? 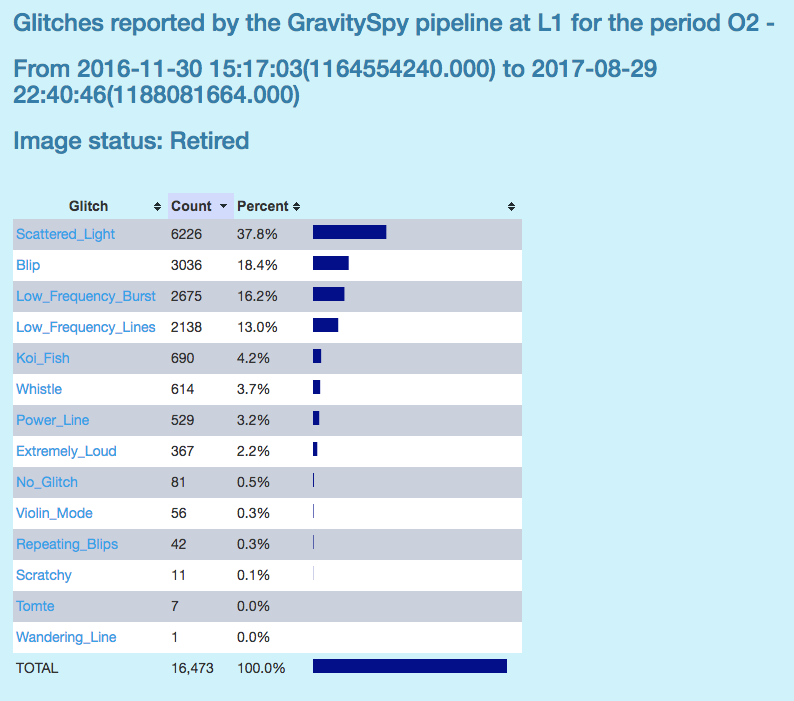 Thanks to the hard work by GravitySpy Citizen Scientists, we now have more than 53,000 retired images, images that have had enough consistent classifications by citizens that we are quite sure they are correctly categorized. 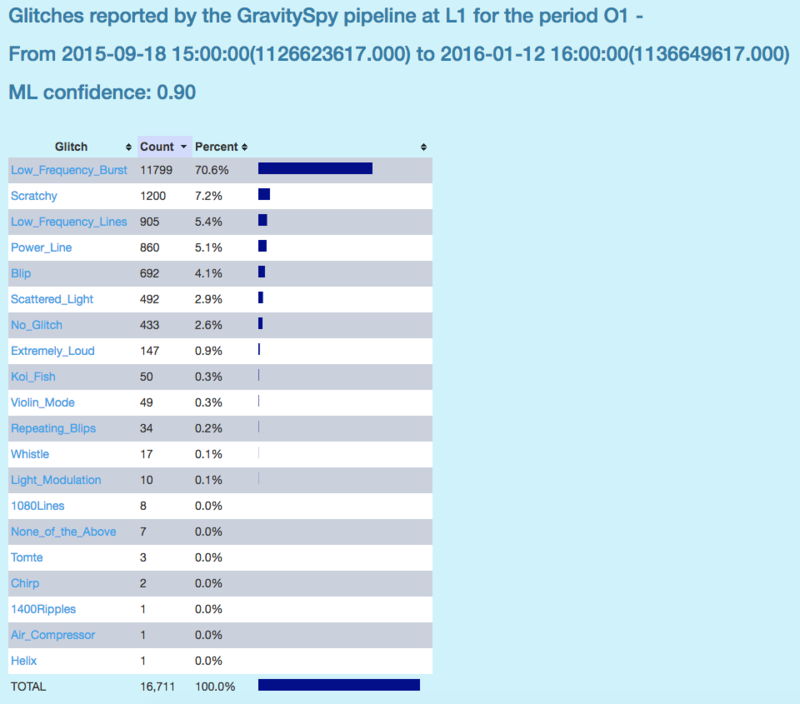 New images are retired every day, so this data set is always growing. 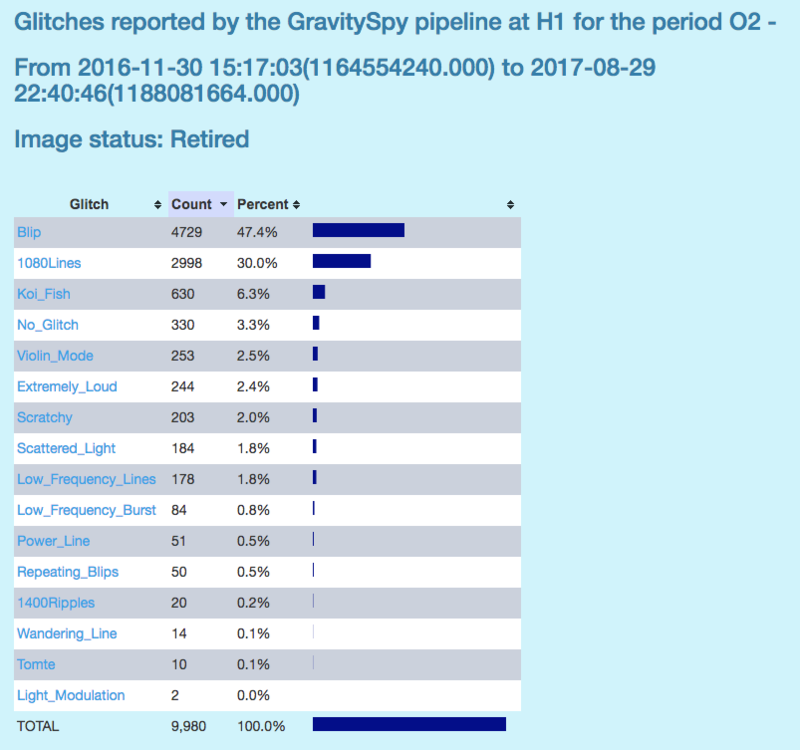 Using this set of retired images, along with information from machine learning image analysis, has allowed us to get a clearer picture of which glitches appear often and rarely in LIGO Hanford (H1) and LIGO Livingston (L1). Since image retirement relies on classifications by citizens, the images that get retired the fastest and most often are those that are the clearest, the ones that contain only one sort of glitch, and look like the example images. Thus using only retired images may not be a good measure of the total number of glitches. Because of this caveat, we also looked at glitches that the machine learning algorithm identified as belonging to a given category with a confidence of 90% or above. Looking at the summary information for categorization done by these two methods for LIGO’s two Observing Runs, O1 and O2, we found that there are a handful of glitch categories that are never or almost never found in H1 and L1. For Hanford, we have determined that Paired Doves and Helix happen infrequently. Similarly for Livingston, 1080 Line, 1400 Ripple, Air Compressor, Helix, Light Modulation, Paired Doves, Tomte, and Wandering Line are very rarely used. 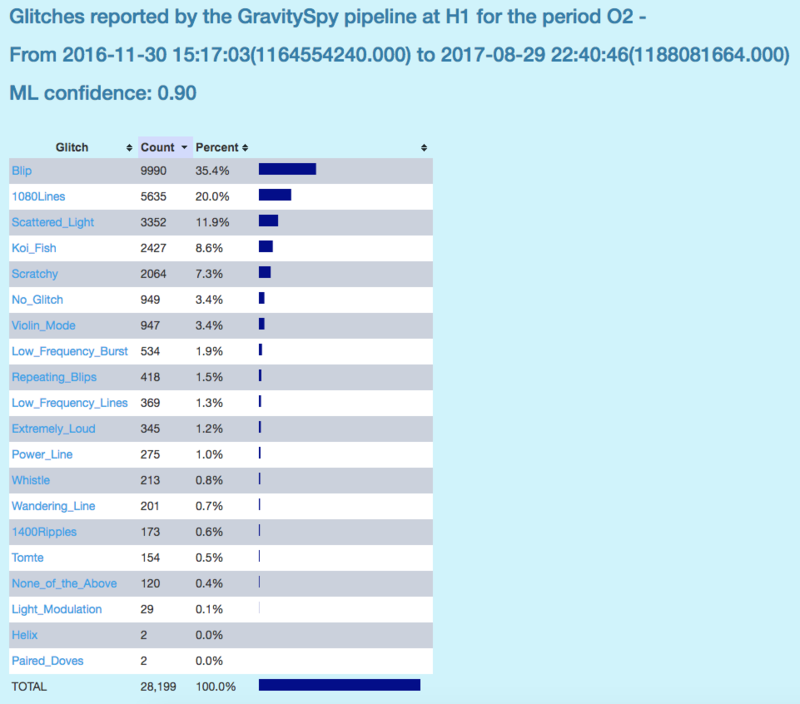 For the interested reader, below are links to screenshots of the full summary of retired and machine learning categorizations. Again, thank you all for your continued hard work in classifying these glitches. Without you all, this wouldn’t have been possible!